"Slow children crossing" or "Caution children". These are very important phrases that appear on many an ice cream truck stretching from the USA to as far as Australia. Usually on the back of the truck, the words are there to alert drivers to the fact that children love ice cream and often so much so that they'll forget to look out for traffic once they've got an ice cream cone in their hands. It varies from country to country what the warning actually says - for example, in the UK I've seen: "Drivers remember, children forget" which is really memorable. Whatever the words, it's crucial for drivers to remember that they were once children and, if they think back, most will probably recall excitement at the idea of the ice cream truck coming down the street. We should seek to preserve that innocent excitement - ice cream is really great fun after all. The sound of the ice cream truck's unique musical jingle, followed by the sight of the colorful truck coming down the street are strong memories for me as a child. Sometimes the ice cream truck would be different (maybe the other broke down or a different ice cream vendor took over the route), but it didn't matter - the truck was always a colorful vehicle and the ice cream always tasted great! In the USA, the old 'Good Humor' ice cream trucks of the 1960's became part of American popular culture. 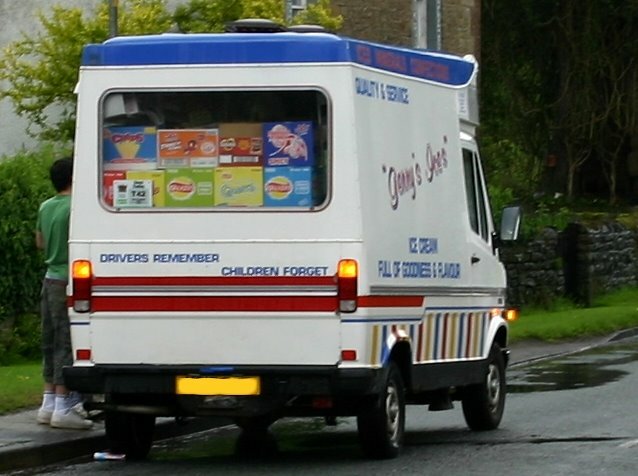 In the UK the equivalent was 'Mr Whippy' (as seen in the Beatles movie 'Help'). British style ice cream trucks are also popular in other countries, especially where there is a tradition of a strong ex-patriate community. Hong Kong is a good example - on Hong Kong island there's often one parked near the Star Ferry terminal. Out in the Far East, some countries opt for a different motorized way of selling ice cream - in Thailand for example, you'll see ice cream sold from a specially modified motorcyle that has a special sidecar 'freezer'.